First of all we are sorry we've taken so long to get this blog post out. We've been going none stop since our last blog post and combined with poor WiFi it's just taken us a while. 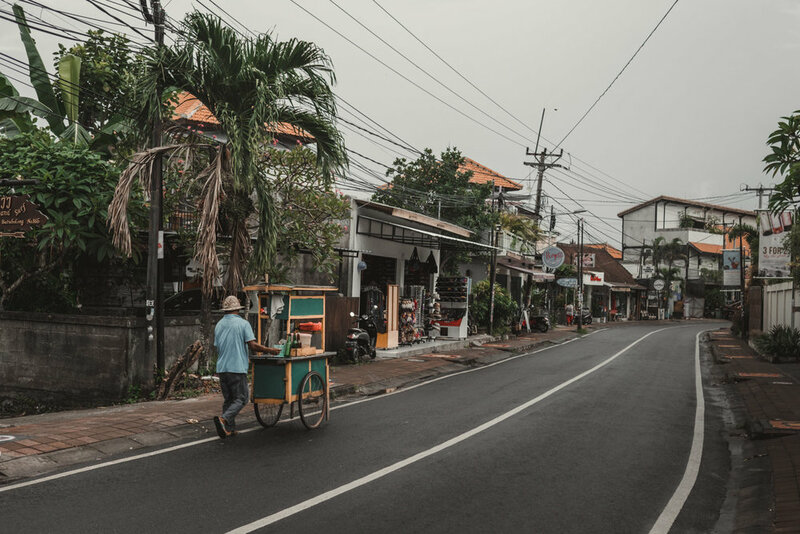 We travelled from Jimbaran to the beautiful, laid-back town of Canggu. This is mainly a surfer's town and has loads of up and coming places to eat and hang out. We especially liked the lawn bar and restaurant. The lawn overlooked the ocean and we sat on the grass and ate some good grub, it also has an infinity pool to cool off in. 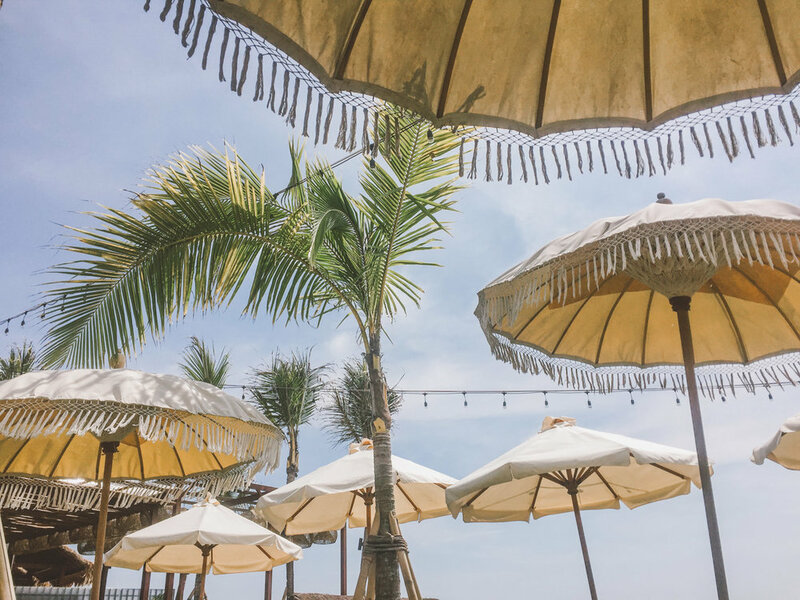 We were in Canggu for two nights and were hosted by the Canggu Beach Apartments and we would like to say a massive thank you as we really enjoyed our stay! It was a lovely quiet place and a great location to the beach and local shops. The apartments are decorated really nicely and have all that you need including a kitchen and a beautiful smoothed concrete bathroom. Canggu has some of the best Mexican food we have eaten and so much choice, we were seriously impressed. It also has a place called Nalu bowls which is a popular spot to get a morning smoothie bowl. There were just too many choices of restaurants and cafes to eat at for our two night stay. I think we will have to visit again! We were really looking forward to the next part of our trip (the bit we were the most excited about!) We headed into the middle of the island to a place called Ubud. This town is surrounded by rice terraces, jungles and waterfalls. It is also only a short drive to the volcanoes and lakes nearby. We booked an Uber who we noticed was acting a little strange as they are worried about local taxi gangs kicking their cars. He asked if we could pay him cash and he would cancel the Uber trip so the taxis couldn't track him, this was fine as we have done this before. While loading the bags into the car I forgot to check that he had actually cancelled the Uber and it wasn't till the next morning that I realised he had scammed us. I messaged him and he explained he had cancelled and played his innocence, which wasn't very convincing. Our driver was from Java and some of the locals from Bali had previously cautioned us about the Javanese drivers. Luckily, Uber refunded the money. Ubud is incredibly beautiful, the colours of the greens and the vines that hang for the trees let you know you are surrounded by jungle. The jungle is one of my favorites environments, despite the bugs that bite. We hired a scooter for 4 days and planned to visit some waterfalls in the area. 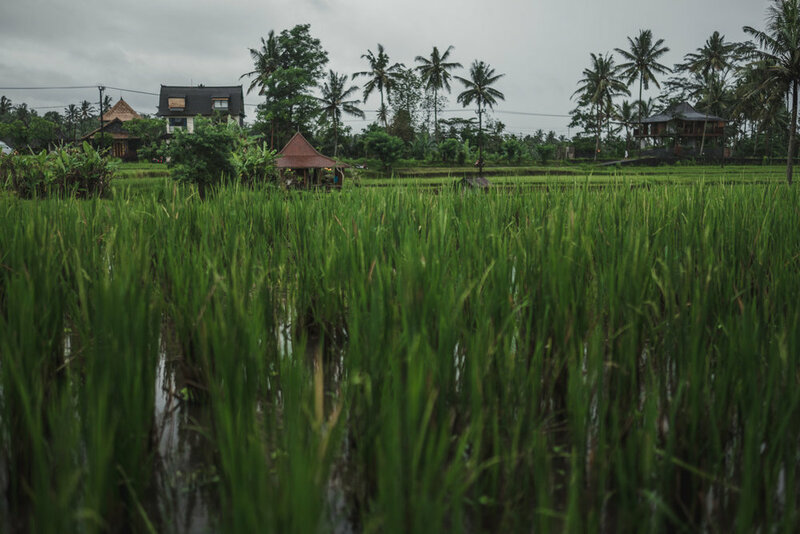 We were visiting Bali in their wet season and so far we had been spoilt by dry hot days and thunderstorms at night. We considered ourselves very lucky. The first two days in Ubud though was non stop heavy heavy tropical rain. It didn't stop for 48 hours! We weren't going to let this stop us and jumped on the scooter to visit some waterfalls. This worked out really well as the waterfalls were deserted and we had them all to ourselves. We also visited the Monkey Forest which was so much fun, there were monkeys everywhere you looked and you could buy bananas to give to them, they looked very well fed and some would just jump on you and try and open your bag - they were very clever and cheeky! We made sure we put our glasses and phones away as in Uluwatu I almost got my sunglasses taken from me by a monkey. We had our friend Made (pronounced Mad-ee) drive us to two more waterfalls and two volcanoes on the 23rd December. Made had already driven us a couple of times when we had needed to sort out our visa and change accommodation. We loved Made he was such a kind person who was always willing to help us out, he was very accommodating to the places and things we wanted to see. If you want the best driver on Bali then let us know and we can share his details with you. He drove us to Mt Batur a volcano that had erupted as recently as 2000. I was also amazed at the lava field, which is still clearly visible from a major eruption in 1968. Apparently Mt Batur was one of the most forceful eruptions in history. Next we drove past camp after camp of displaced villagers from the Mt Agung eruption, the evacuation camps were only temporary but many people still lived in them waiting for it to be declared safe to return. There was still an exclusion zone around the volcano and we went to a restaurant with a clear view of the volcano Agung. It was a beautiful place to have lunch with amazing panoramic views, the fruit bat swinging out the front made it even better! One of the best things about Ubud is that it is close to lots of incredibly cool waterfalls (too many to choose from). We drove to two waterfalls before heading back to Bali. We were lucky to get them pretty much to ourselves and take photos without feeling rushed or having people photo bomb them. Normally very very busy, but just us on this morning. At around 7pm at this time of year they have loads of flying termites everywhere! They swarmed lamps and light they were drawn to like in bugs life, when the flies go "Don't go into the light!" "I can't help it, it's so beautiful!". One place we stayed they were crawling under our door and into our room because our lights were on probably. The only thing stopping them getting to us was our mosquito net surrounding the bed. We knew that they all died within an hour, so we decided to quickly get out of there and get some dinner at a local wood baked pizza cafe. When we got back to our room the bugs had all disappeared. The next morning we packed up and got ready to leave for our new accommodation. We had booked a place in central Ubud with a pool for Christmas. It had a gingerbread house in the reception area screaming 'eat me', however there was a sign saying 'display only', we asked the Chef if they could make us some more as we really craved some but they had used up all the dough. Funnily enough we ventured into town seeing if there were any bakeries that might sell it, silly really thinking we would find anything BUT we found an ice cream place that had gingerbread ice-cream which satisfied our taste bud cravings. The next couple of days were spent face timing family back home for Christmas and relaxing by the pool. Our time in Bali was coming to an end. We didn't want to leave! We realised early on that we felt rushed in many places and that even though we were in Bali for 3 weeks there was still so much we didn't get to see and felt like we missed out, however we came to realise that we would just have to come back and staying places longer makes you realise how much more there is to see and you could easily stay there for months and not see it all! We were sad at leaving, as we absolutely loved it and definitely want to go back but we are excited for the next part of our adventure. Panoramic view of Mount Batur and the lava flow.